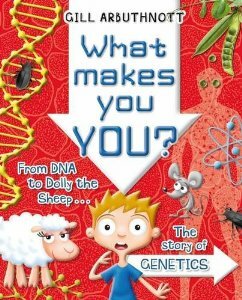 I’m very excited, because I’ve just got my hands on an advance copy of What Makes You You? – my new DNA book from A&C Black – and I think it looks fabulous. Things like this always make me regret my complete lack of artistic ability, but I really mustn’t grumble when there are people with real talent out there to bring my writing to life like this, so thankyou Marc Mones and everyone else who worked on the design. I’m off to the Kingdom of Fife on Friday, to do school visits in St Andrews, Kingsbarns, and Pittenweem about Dark Spell, my creepy new book set in Fife. Look forward to seeing you all there! Ooo – so close! But you will be busy being famous – I must try to catch you on an emptier day! Have fun – and the new book looks great! The DNA book looks fascinating! And I gather Dark Spell is wonderful – my younger daughter really enjoyed it. Amazing cover too. Well done on so many great books!